As Hitler’s propaganda chief, Joseph Goebbels was responsible for promoting the Nazi Party’s political agenda – and instilling anti-Semitic values in the broader population. Born into a poor Ruhr family in 1897, young Goebbels suffered from a deformed right leg that kept him out of the military during World War I. He attended university instead and went on to obtain a doctorate in literature (for the rest of his life he preferred to be addressed as Doctor Goebbels). Goebbels fancied a career as an essayist and a poet – but despite publishing a book he had no success in this field. His writing abilities were instead put to use by the NSDAP, which he joined in 1924. In 1926 Goebbels was appointed Gauleiter (party chief) for Berlin, a position of some importance. There he began publishing his own newspaper, Der Angriff (‘The Attack’). Though not as extreme, ribald or hysterical as Julius Streicher’s weekly Der Sturmer, the content of Der Angriff was still frequently anti-Semitic. Its self-declared mission was to expose corruption and deceit at all levels of the Weimar government – and Jews were often placed at the centre of these accusations. Jewish politicians, police chiefs, bureaucrats and business owners were subjected to withering personal attacks, many of which were personally written by Goebbels. These savage libels were accompanied with anti-Semitic caricatures, supplied by talented cartoonist Hans Schweitzer. In its first few years Der Angriff was fairly insignificant, selling just a few thousand editions each week, almost all of those in Berlin. But as NSDAP popularity grew, so too did Der Angriff’s circulation, which exceeded 110,000 by 1932. 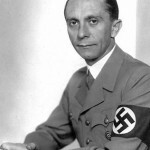 Goebbels’ skill as a writer, propagandist and organiser improved his own position within the NSDAP. In 1932 he oversaw Hitler’s campaign for the presidency (Hitler was defeated but Goebbels’ campaign boosted the fuhrer’s public profile enormously). Goebbels excelled at organising rallies and processions and made innovative use of radio and cinema. In 1933 Hitler appointed Goebbels ‘Minister for Propaganda and Public Enlightenment’. In this role Goebbels was to dominate Germany’s communication media, taking over some newspapers and radio while silencing those that might criticise the Nazis. His attitude to public opinion was cynical. Propaganda was a government prerogative, Goebbels claimed, and to be successful, propaganda messages had to be kept simple and repeated often. “What luck for governments that people don’t think,” he wrote. “Intellectual activity is a danger to the building of character.” Goebbels was also a prolific speechmaker. In time, he became the NSDAP’s second most influential orator after Hitler. His speeches were generally relaxed but were laced with large amounts of wit, sarcasm and snide commentary. In the mid-1930s Goebbels ramped up the anti-Semitism in his speeches, possibly an attempt to curry favour with Hitler. He began to focus more on anti-Jewish themes: the ‘uncleanliness’ of Jews, the existence of criminal elements in Germany’s Jewish population, and Jewish control of foreign governments and media. There were also ominous threats and promises to deal with the “Jewish problem” in Germany specifically and Europe generally. “We’ll shut their lying Jewish mouths!” Goebbels promised in one 1938 speech. It was Goebbels’ violent anti-Semitism which seriously undermined his reputation in the eyes of journalists. He was not content to publicise the decrees against Jews issued by others; he himself actively promoted the persecutions and pogroms. It was Goebbels who planned the blackmail of the Jews who had left Germany at the expense of those who remained, by ordering the closure of Jewish-owned shops in 1933. It was Goebbels who harried writers, artists and actors who had Jewish relations or connections, though he was prepared to come to terms with certain Jews of exceptional talent, such as Fritz Lang. Goebbels also played a leading role in instigating Kristallnacht, Nazi Germany’s largest anti-Jewish pogrom prior to World War II. It began on November 9th 1938, shortly after the murder of a German diplomat in Paris by a Polish Jew. Word of this reached Munich, where Nazi leaders were celebrating the 25th anniversary of the Beer Hall putsch. Goebbels by this point had fallen out of favour with Hitler over an extra-marital affair (Goebbels was a notorious sexual philanderer while Hitler was fond of his wife, Magda). In Munich, Goebbels asked the Fuhrer if he might deliver the commemorative address to party leaders; Hitler agreed then left before Goebbels spoke. In his speech, Goebbels urged NSDAP leaders around Germany to take action against the Jews, comments that were probably intended to curry favour with Hitler. Whatever Goebbels’ motives, within hours attacks against Jews and Jewish-owned property had broken around in several German cities. More than a hundred Jews were killed and another 30,000 were imprisoned; Jewish Germans incurred more than $US1 billion in property damage and destruction. Goebbels was also responsible for commissioning several anti-Jewish films, including Jud Suss (‘Jew Suss’) Die Erwige Jude (‘The Eternal Jew’) and Die Rothschilds (‘The Rothschilds’). All three were released in 1940, possibly as a concerted government effort to prepare Germans for stronger action against the country’s Jews. All three movies represented Jews as devious, deceitful, criminal and parasitic. In Jud Suss, the most commercially successful of the three, the main character pretends to be Christian before engaging in swindling, political subversion and the molestation of Aryan women. He is eventually discovered and hanged. The impact of Jud Suss was so powerful that several SS and einsatzgruppen units were ordered to watch the film before deployment. The less popular but better known Die Erwige Jude took the form of a documentary, offering bogus evidence and exaggerated statistics about Jewish crimes and misconduct. The consensus view among historians is that Goebbels was one of the worst ‘Jew haters’ in the upper echelons of the NSDAP. Some claim Goebbels’ anti-Semitic prejudices were so strong that they radicalised those around him, even Hitler. In his introductory notes to Goebbels’ diaries, published in 1948, Lochner suggests they “reveal Goebbels as the unflagging motive force behind the vicious anti-Semitism of the Nazi regime … [his] role was to keep Hitler’s mind inflamed.” Yet later historians have questioned the motives and sincerity of Goebbels’ anti-Semitism; some suggest he may have purposefully increased his anti-Semitism to gain Hitler’s trust and favour. As a young man, Goebbels demonstrated little animosity towards the Jews; he studied and admired Jewish writers; and he allegedly criticised anti-Semitic writers for the “primitive” irrationality of their views. Yet 15 years later, Goebbels had transformed into a loud and poisonous anti-Semite. Whether this transformation was sincere – or whether it was a role Goebbels played to improve his own standing – is debatable. But what is certain is that Goebbels’ propaganda and rhetoric injected anti-Semitism and its poisoned values into German public life – a process that cleared a path for the genocide that was to come. 1. 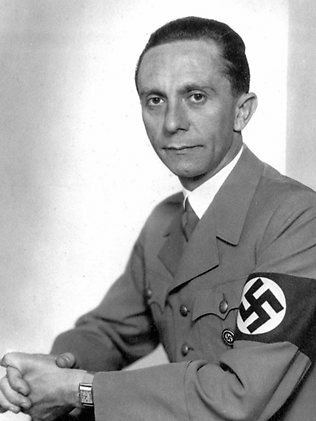 Joseph Goebbels was a leading Nazi, educated, a capable writer, propagandist and political organiser. 2. He became propaganda minister in 1933 and used innovative methods to increase Nazi support. 3. In the mid-1930s Goebbels focused his propaganda attention to attacks on Germany’s Jews. 4. He delivered the speech that instigated the anti-Jewish violence of Kristallnacht in November 1938. 5. While Goebbels’ public anti-Semitism was intense, there is debate over how sincere this actually was.